On April 6, 1899 The New York Times listed the wedding gifts received by Mr. and Mrs. John Henry Hammond, including “a necklace and tiara of diamonds from her parents.” The newspaper failed to mention their other gift of a limestone mansion on 91st Street. The bride was the former Emily Vanderbilt Sloane and when her father, William D. Sloane of W. & J. Sloane, approved her engagement to Hammond he announced he would present the couple with a new home. John Hammond's male ego was bruised at the thought. “I will not be a kept man,” he bristled. He apparently was not sufficiently indignant to refuse the gift, however. Sloane purchased the lot of land at No. 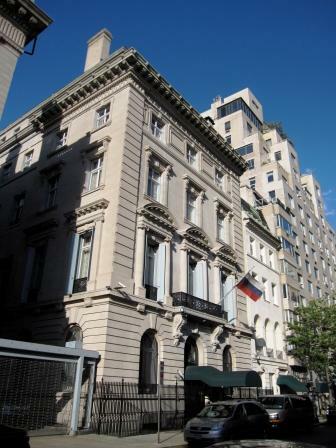 9 East 91st Street from Andrew Carnegie and architects Carrere & Hastings were given the commission to design the house. Completed in 1903, it was a grand Renaissance-style mansion which Emily Sloane filled with Louis XVI-style furniture manufactured by her father’s company. Modeled closely upon 16th and 18th Century Italian palazzo designs, it offered the family a private courtyard with fountain as an elegant respite from summer heat. Inside were elaborate marble mantles and stairways, crystal chandeliers, tapestries, Oriental rugs and paneled walls with gilded moldings. The large windows onto 91st Street were hung with heavy damask curtains. The house had two elevators and on the second floor a suite of grand public rooms often entertained 300 guests at Mrs. Hammond’s frequent musicales. Here were an Elizabethan-style library with 18-foot high walls and a Louis XVI 50-foot by 28-foot ballroom. As the Hammonds five children grew, the regulation-size squash court on the fifth floor was used less for squash than for roller skating. Mrs. Hammond’s taste in “correct” music was tortured when John, the youngest of the Hammond children, took an early shine to jazz music. When he announced that he had invited Benny Goodman to the house to play, Emily Hammond consented so long as the musician limit his selections to Mozart. Eventually, Goodman not only played jazz at 9 East 91st Street, but he married one of the Hammond daughters, Alice. In 1946 the Hammonds sold their home to Dr. Ramon Castroviejo, an ophthalmologist who used it not only as his residence but as a private clinic as well, making slight alterations to the interior. 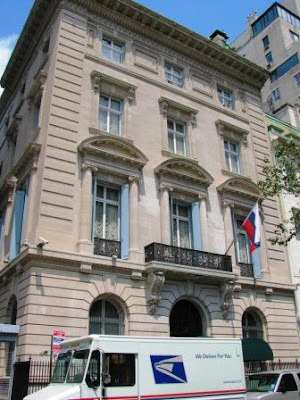 He remained in the mansion for 31 years before selling it to the Soviet Union in 1975 for $1.6 million, one year after the US and the USSR agreed to establish consulates. William Gleckman was hired to modernize the structure – updating the electrical service, installing air-conditioning and a theatre, and gating off the courtyard. Although the Soviets completed the renovations a year later, they were unable to move in because the US had not finished their consulate in Kiev – the agreement stipulated that neither consulate could open before the other. Trouble arose when, in December 1979, the Soviets intervened in Afghanistan and President Jimmy Carter put a freeze on the US-USSR consulate program. Relations worsened when martial law was enacted in Poland. The Soviets sealed up the building. Heavy metal shutters covered the great windows and piles of snow accumulated at the doorway where bejeweled guests once arrived knowing they would not be offered a cocktail. The Hammond’s grand palazzo sat empty and neglected for 13 years with no heating nor maintenance. Water seeped into the walls and ceilings, paint peeled from the walls. 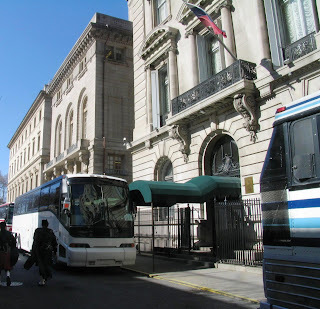 When the Russians opened the doors for the first time in 1992 “everything was a big mess,” according to the consul general of the Russian Federation in New York, Ivan A. Kuznetsov. Groups of sixteen Russian artisans were flown in from Moscow for 9- to 10-month shifts, living on the top floor at night and working on the house during the day. When one group would go back to Russia, another would arrive. The president and publisher of Random House, Harold Evans, took on the restoration as a pet project. He cajoled American interests to donate time, fabrics, furniture and creativity in bringing the Hammond house back to life. Stanley Barrows, former chairman of the interior-design department at the Fashion Institute of Technology and decorators Mario Buatta and Albert Hadley threw themselves full-force into the mission. Diane Nixon and Robert Ashley of Ashley Studio donated three exclusive fabric designs for the library, ballroom and music room. Twenty years after purchasing the Hammond mansion, the Russian Consulate opened officially in 1995. After two years of restoration the gilded paneling glinted from the lights of crystal chandeliers again and music, once so important to Emily Vanderbilt Sloane Hammond, was heard again. The John Henry Hammond house is considered today one of Carrere & Hastings’ finest examples of residential architecture. In the early 1940s, when Emily Vanderbilt Hammond was in her 60s, she met my Mother, Hungarian concert pianist SARI BIRO,with whom she devotedly studied the piano for many years. I remember the musicales Mrs. Hammond gave in her ballroom at which she would perform the pieces she had just learned. At one Christmas party when I was about four, I was invited to dance to the Naila Waltz for the guests - a uniquely happy memory. Mrs. Hammond remained Sari Biro's lifelong friend. Mr. Hammond was a renowned engineer who is lauded in Bernard Baruch's autobiography. What wonderful memories. Thank you for sharing. I had never read about Emily having learned the piano from your mother. Very interesting information. Thanks again.